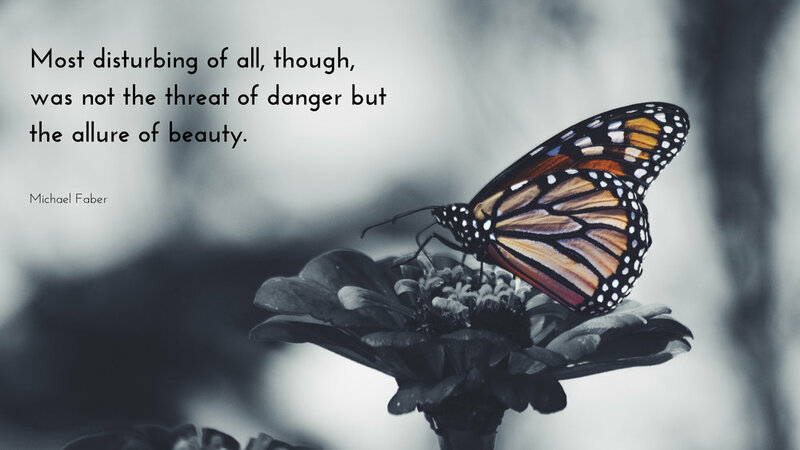 These are the words of Mertensia Romilly to Veronica Speedwell just as they are about to embark down the path through Mertensia’s Poison Garden in Deanna Raybourn’s A Dangerous Collaboration (see GIVEAWAY details here). A poison garden may sound like a thing out of a fairy tale, but history has recorded at least two times when a garden dedicated to the cultivation of all things noxious was assuredly a real pursuit. The first of such gardens was begun by the infamous Medici family. This ought not come as any surprise for those of you aware of the dreadful history of that rather rapacious family. In fact, Catherine de Medici, who married a French king and produced three more, had an entire room in the Chateau de Blois know as the Chamber of Secrets, where all her poisons of choice were stored at the ready for whatever purposes she could devise. While today we might look a little more open-mindedly on such a room, even applauding the ingenuity and expertise necessary to work with such herbs and plants, in Catherine’s day, that room was considered little more than a nefarious apothecary’s arsenal. And, given that history had recorded her no better than an evil step-mother, to say nothing of her ties to the Medici family, Catherine’s Chamber of Secrets carries the pastiche of villainy with it. The Orto Botanico di Padova, the Botanical Garden of Padua, is where the Medici poison garden can be found. It is important to note that a great many of the poisonous plants in its collection also serve a medicinal purpose. As a person who finds this sort of herbalism fascinating- as who has also amasses quite a library of resources to perfect my own balms, salves, embrocations, tinctures, and the like- I know that there is a VERY fine line between what will medicinal aid and fatal poisoning. Helpful and fatal are two sides of the same coin where herbalism is concerned. 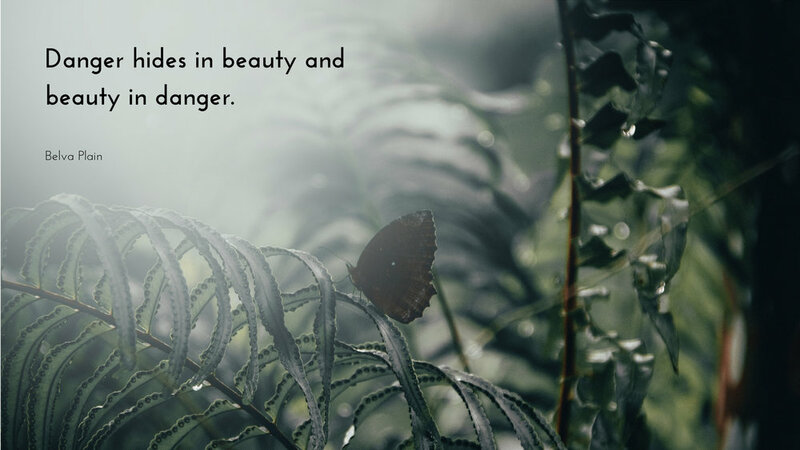 It would appear that beauty and danger are two sides of the same coin for herbalism as well. Case in point, nightshade. While we are familiar with many varieties of nightshade, such as potatoes, tomatoes, and peppers, within in the solanaceae (the scientific name) is belladonna. Also know as deadly nightshade, belladonna (fair lady in Italian) boasts beautiful berries that are so toxic, only a few ingested will kill a child. The Fair Lady might be beautiful, but she is lethal, my dears. We know from history that the Medici family put their poison garden to use in thwarting their enemies and those whom they considered competition in their quest for power and influence in Europe. But, while that might be the reason for the first poison garden, it most certainly isn’t for the second. Jane Percy, wife of the 12th Duke, rolled up the proverbial sleeves, or perhaps in this instance it would be best to say she donned the proverbial thinking cap. You see, inspired by the poison garden in Padua, Jane alighted upon a novel idea- planting a poison garden of her own. Enlisting landscape architect Jacques Wirtz, who boasts the Tulieries and the French president’s gardens among his work, Jane created a garden of such intrigue that over 600,000 people visit it every year. 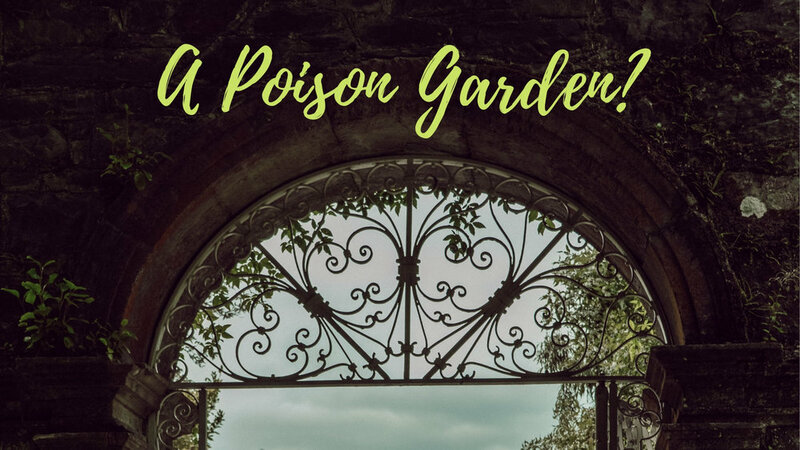 Those are the words written on the signs posted on the iron gates that provide entrance into Alnwick Castle’s Poison Garden. They may seem a trifle heavy handed or melodramatic, but I assure you, they speak the unadulterated truth. As the fictional Mertensia warned Veronica Speedwell, don’t touch, smell, or eat anything that lies therein. There were two reasons Jane Percy planted her poison garden. The first started with that fascination we all tap into when faced with the macabre. With so many gardens dedicated to the medicinal value of plants, Jane wanted to explore the toxic side of all things flora and fauna. Then, once the garden was designed and planted, she wanted it to be a place where children could come and learn about plants that are common and familiar but possess pernicious, lethal effects, such as laurel hedges or angel’s trumpets or the fragrant- and personal favorite- night-blooming jasmine. Cestrum nocturnum, night-blooming jasmine, is featured in Mertensia’s poison garden for a particular purpose. The plant provides nourishment for the oleria romilleria, the Romilly Glasswing butterflies. In A Dangerous Collaboration, lepidopterist Veronica Speedwell has been lured to St. Maddern Island with the promise of oleria romilleria for her vivarium collection in London. In one exquisite scene, Veronica is afforded the rare chance to watch the Glasswings feast on cestrum nocturnum nectar before the blooms close for the day. Needless to say, Veronica earns this chance fair and square, but you’ll have to read about Veronica, her Glasswings, and the Romilly Poison Garden for yourself to see how. You can enter for a chance to win a signed copy of A Dangerous Collaboration here at Whiskers on Kittens. 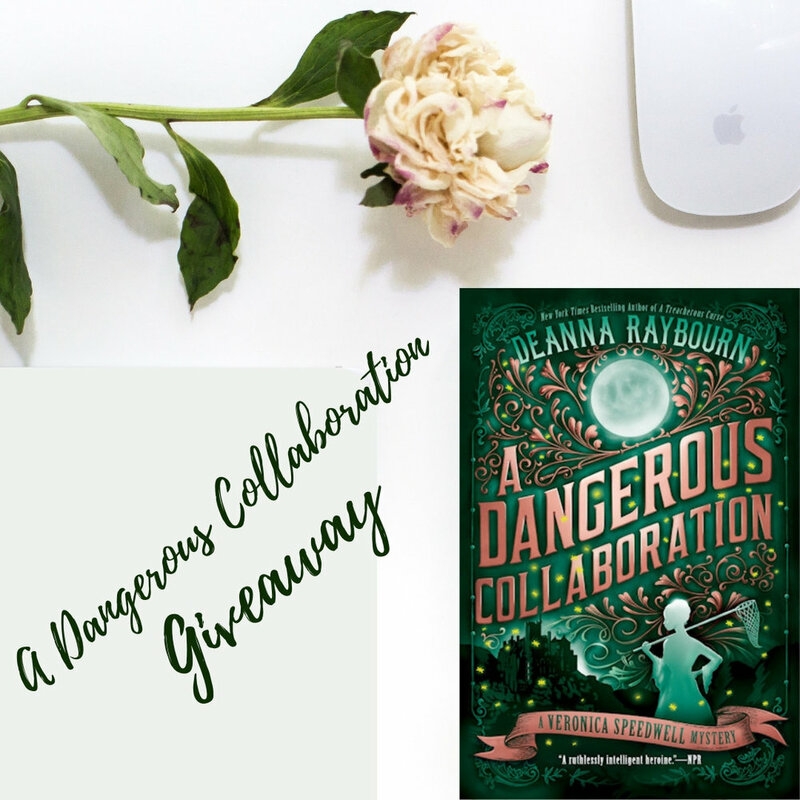 Simply click on the link to A Dangerous Collaboration Giveaway and follow the instructions. If any of you, dear readers, have a green thumb or a penchant for scientific nomenclature, then you’ll have noticed two things of particular interest in Deanna Raybourn’s name choices in A Dangerous Collaboration. The Romilly poison garden is the pet of Marcus Romilly’s sister, Mertensia. Mertensia is an elaborately Latin way of saying bluebells. But of even more interest is Veronica Speedwell. Veronica is a type of plant with sturdy stalks, pointy leaves, and spikes of blue-purple flowers. Veronicas are also known as Speedwells, and while they are deer and rabbit resistant- a boon in any gardener’s book- their riotous hues attract butterflies. An ingenious name for an intrepid adventurous. The women of A Dangerous Collaboration are well names as both Mertensia and Veronica are floral varieties of hardy constitution, and, since they are both perennials, will bloom every year once they are established. There’s no getting rid of them so easily. Just the sort of women I like to read about!